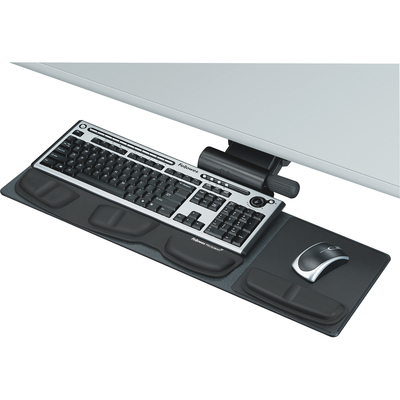 Compact Keyboard Tray Provides Comfort And Maneuverability For Smaller Work Spaces. Ideal For Smaller Work Spaces With Diagonal/Curved And Straight Workstations. Lift And Lock Feature Lets You Adjust The Height From 3-1/2" Below The Track To 1/2" Above Track To Reposition, And Then Straighten To Lock In Place. Single Manual Knob Adjusts Tilt Up To Negative 10 Degrees For Optimal Comfort. Warning Trak Helps Prevent The Mouse From Sliding Off The Mousing Platform. Health-V Memory Foam Relieves Wrist Pressure To Help Prevent Carpal Tunnel Syndrome And Features Microban Antimicrobial Protection So The Keyboard Tray Stays Cleaner. Standard, 19" X 19-1/2" Platform Accommodates Right-Handed And Left-Handed Mousing. Track Length Is 17-3/4". More From The Manufacturer.